Distinctive features: Sub-Shrub; Low plant, tough leaves, wintergreen smell.  Fringed Polygala (Polygaloides paucifolia) - no wintergreen smell. See the Ontario Wildflowers website, Fringed Polygala. Flowers: Spring, Summer; White; 5 parts (petals); White, hanging down under the leaves. Leaves: Alternate, Simple, Toothed; Alternate, simple. Crowded near the top of the plant. Roundish/oblong, tough, evergreen. Aromatic. Fruit/Seeds: Red berries hanging down under the leaves, stay on the plant through the winter (if no one eats them!). Edible: Berries are edible. 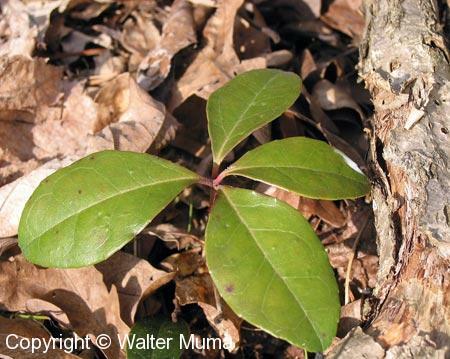 Leaves may be chewed for the wintergreen taste. Photographs: 88 photographs available, of which 5 are featured on this page. SCROLL DOWN FOR PHOTOGRAPHS. 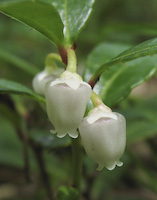 A Wintergreen plant in early spring. The leaves are tough but edible if chewed well. Actually, you should just chew them for flavour, and then spit out the remnants. Flowers. They hang down below the leaves. The red berries. They are edible, and have a strong wintergreen flavour. Closer view of a berry.